Mastering your Vuly Deck: 3 must-know skate tips. We’ve shown you a range of exciting beginner and intermediate-level tricks for your Vuly Deck. However, if you’re new to the skating scene, then you might require some tips on how to master those perfect beginner’s techniques. No need to worry about grazed skin or broken bones, your Vuly is the ultimate soft landing pad for learning the essentials. It'll have you on your way to becoming the next Tony Hawk in no time! Foot positioning is vital for all board tricks, and it's important for preventing awkward landings. No matter if you’re left-footed or right-footed, you should always have one foot at the flat front end of the board and one foot at the back end. 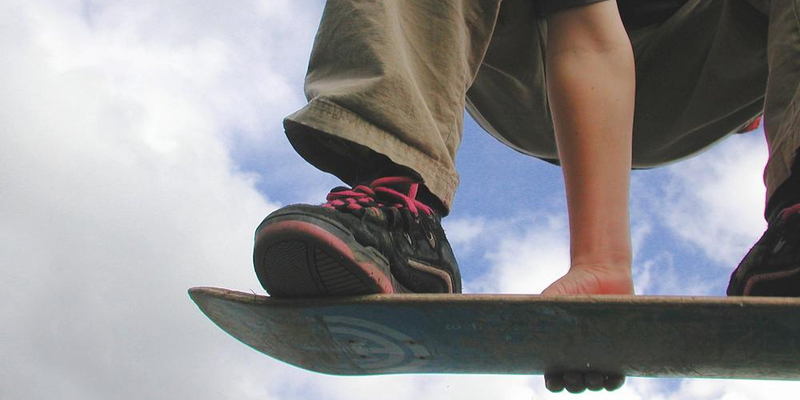 Before attempting a trick, make sure that both feet are sideways across the board for maximum stability. You can determine your dominant or 'riding' foot with one easy test; stand neutrally and fall forward, and whichever foot naturally jumps out first is your dominant foot. This foot will later push you along on your skateboard, and it's positioned at the back of the board during most tricks. Having the correct stance aboard your Vuly deck will help make those beginner tricks we've talked about previously easier for you to grasp. Ensure that your knees are slightly bent, your back is straight and your abdomen is tight. A strong core is a must for balance! It’s also helpful to keep your weight in your feet, too. Allowing your top half the ability to move around is a sure way to topple off your deck! Skate shoes or sneakers are a valuable addition for skateboarding. They prevent your feet from landing in awkward positions when you’re attempting tricks. For practise on your Vuly Deck, trampoline socks can perform a similar function. They help to grip the board and assist you with a whole manner of essential skating moves. When we talk about skate shoes, there are two kinds: vulcanised and cupsoles. We recommend going with the slimmer, more flexible vulcanised style, which is designed for general use, rather than the heavily padded capsules design. They're better suited to skaters landing on concrete from greater heights. Remember: Never wear shoes on your trampoline. We’d love to hear how you went learning basic skating techniques atop your Vuly Deck. Let us know if you have attempted any of our beginner tricks since!